We’ve all seen so many of those airplane safety demos, that we could practically recite them in our sleep! But did you know that there are some extra safety precautions you can take on a commercial airliner that no one ever tells you about? Wear natural fiber clothing. In case of a fire, synthetic clothes will melt to your skin. Pick a seat within 5 rows of an exit. Statistics show that you’re more likely to escape in an emergency if your seat is within this distance of the door. Count the rows between your seat and your nearest exit. If smoke obscures your vision, you can still feel your way to the exit. Choose aisle or window, based on your biggest concern. Aisle seats let you evacuate more quickly, but terrorists are less likely to target people seated next to windows. Both the front of the plane and the back have their crash advantages and disadvantages. First class is more likely to be damaged in an impact…but if you survive, it’s harder to evacuate from coach than it is from the fancy seats. Watch the video for more details about each of these points, plus learn why a rear-facing seat is actually the Gold Standard in airline seating! when it comes to in-flight safety…so that YOU don’t make them, too! Today’s topic: Secret Airplane Safety Tips! We’ve all seen so many of those airplane safety demos, that we could practically recite them in our sleep. But did you know that there are some extra safety precautions you can take on a commercial airliner that no one ever tells you about? Well today, I’m going to share several of those tips for you, so that you can use them next time you fly. My first tip is a simple one: wear natural fiber clothing. If you think about it, if there’s a crash and then there’s a fire, the last thing you want to be doing is wearing plastic! Plastic melts to your skin, causing extra severe burns, so just think about it next time you get dressed, before you get on a flight. Wear wool, wear cotton, wear silk, or–if you don’t mind the wrinkles–even go for some linen. Anything natural is better than something synthetic. My next tip deals with emergency exits. You want to pick a seat that’s within five rows of the nearest exit. Statistics show that if there’s an evacuation necessary, you’re far more likely to be able to get out of the plane if you’re within five rows of that egress point. One extra safety tidbit: count the rows between you and your nearest exit. If there’s smoke obscuring the cabin when it’s time to evacuate, you can FEEL your way along to the exit without having to actually see it. I’ve got another tip for you for seat selection: pick the aisle seat. If you have to get out of the plane in a hurry, you won’t have to crawl over your fellow passengers to make it to the exit point. Now if you’re worried about terrorists more than you’re worried about an airplane crash, my tip is going to be a little bit different: in that case, you’re going to want to sit in the back of the plane, towards a window. You’re far less likely to be singled out for special attention if you’re in that obscure area. Here’s something for you to think about when you select your seat: do you want to fly in the front of the plane or in the back of the plane? The front of the plane has those big cushy comfortable seats; the back of the plane is cattle class. But in the event of a crash with an impact, you’re far LESS likely to survive if you’re in first or business class. Why? Because you’re at the front of the plane where the crash happened! However, if you survive an impact and an evacuation becomes necessary, it’s actually easier to get out of the first and business class section, just because there are fewer people in those cabins. And here’s one more vote for sitting in the front of the plane: the front of the plane is where you can occasionally find seats with a rear-facing configuration. If you think about those infant safety seats that we have in cars, you remember that they are actually mounted in a rear-facing position. Why? Because that’s the safest location or the safest orientation to be in, in case of a crash. 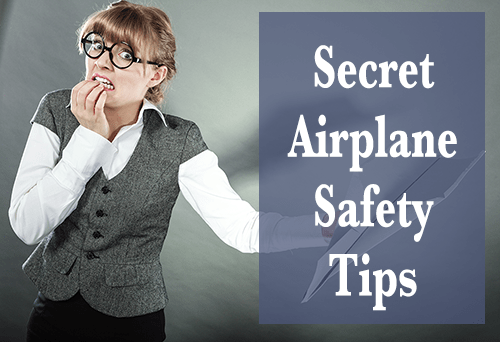 So there are several secret airplane safety tips that you maybe didn’t think about before…but I’m sure you’re going to think about them now! This has been Kathleen Starmer from KathleenStarmer.com, founder of The Art of Smart Travel, and until next time, I’ll see you online! on the other side of your journey.